Cyberarms IDDS enhances Security by denying access to intruders on the network level. Cyberarms provides a pro-active Intrusion Detection and Defense System (IDDS). It's pro-active, because it not only logs, but also reacts to intrusion attempts. Once a "bad guy" is recognized, he won't have access to any of your systems protected by Cyberarms IDDS. Don't give a second chance to hackers! A host-based intrusion defense tool, Dragon Host Sensor monitors individual systems and applications, including today’s most common operating systems, for evidence of malicious or suspicious activity in real time, and monitors key system logs for evidence of tampering. Dragon Host Sensor may be deployed on a protected host or on a dedicated analysis system where logs are forwarded from switches, firewalls, routers and other IDSs and aggregated via SNMP or syslog. 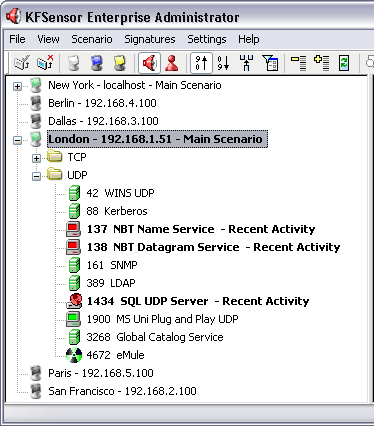 Dragon Host Sensor uses a variety of techniques to detect attacks and misuse on a protected system, including analyzing the security event log, checking the integrity of critical configuration files, or checking for kernel level compromises. This hybrid approach ensures that no misuse goes undetected. KFSensor is a Windows based honeypot Intrusion Detection System (IDS). It acts as a honeypot to attract and detect hackers and worms by simulating vulnerable system services and trojans. By acting as a decoy server it can divert attacks from critical systems and provide a higher level of information than can be achieved by using firewalls and NIDS alone. KFSensor is designed for use in a Windows based corporate environment and contains many features such as remote management, a Snort compatible signature engine and emulations of Windows networking protocols. With its GUI based management console, documentation and low maintenance, KFSensor provides a cost effective way of improving an organization's network security. eTrust Intrusion Detection delivers network protection including but not limited to, defense against deployment and execution of Distributed Denial of Service (DDOS) attacks, malicious and unauthorized use of Internet facilities and other network misuse events. Provides realtime, non-intrusive detection, policy-based alerts, ad automatic prevention. Other protective capabilities include enforcing business-use policies through dynamic URL blocking and logging. Fully open and extensible, eTrust Intrusion Detection extends to other protection products such as proxies, routers and firewalls. Based on the award-winning Snort® rules-based detection engine, Sourcefire® provides best-in-class network intrusion detection with extensive analytics, powerful reporting, and unrivaled scalability. Through the use of Sourcefire 3D® Sensors and one or more Sourcefire Defense Center® management consoles, Sourcefire IPS deployed as an Intrusion Detection System uses a powerful combination of vulnerability- and anomaly-based inspection methods to detect attacks targeting thousands of vulnerabilities. Snort is an open source network intrusion prevention system, capable of performing real-time traffic analysis and packet logging on IP networks. It can perform protocol analysis, content searching/matching and can be used to detect a variety of attacks and probes, such as buffer overflows, stealth port scans, CGI attacks, SMB probes, OS fingerprinting attempts, and more. Snort uses a flexible rules language to describe traffic that it should collect or pass, as well as a detection engine that utilizes a modular plugin architecture. Snort has a real-time alerting capability as well, incorporating alerting mechanisms for syslog, a user specified file, a UNIX socket, or WinPopup messages to Windows clients using Samba's smbclient.